Rent Mistral Kitchen | Corporate Events | Wedding Locations, Event Spaces and Party Venues. Mistral Kitchen was purposely built to be able to conform to different needs, one of them being the ability to host large or small groups for private parties or business meetings. Whether you have a group of eight or eighty, we’re equipped to host your private gathering. Enjoy lunch, brunch on the weekends, and dinner or happy hour nightly in the main dining area. 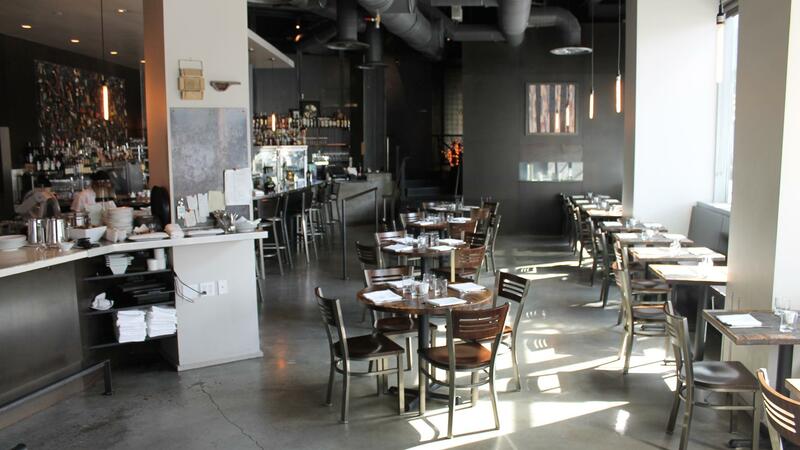 The Jewel Box Bar at MistralKitchen is a venue for before and after dinner. The mix of tapas-style, Korean- and Spanish-inspired small plates is designed to pair primarily with cocktails and beer. Also featured in the Jewel Box Bar is the hand blown glassware of Pennsylvania-based artist Michael Schunke. William Belickis and Michael Schunke formed a partnership in 2014 to design and manufacture the finest cocktail glassware in the world. Like other areas within MistralKitchen, the lounge-like atmosphere of the Jewel Box Bar offers a unique food and drink experience. Belly up to the kitchen counter bar and watch our chefs fire you some clams in the wood-burning oven or a Bone-in Rib Eye in the Tandoor. Uber-talented mixologists will be performing cocktail alchemy behind the bar, or have a seat at the pastry counter bar where our pastry team is waiting to cap off your evening with dessert. You may also opt for a dining table more removed from the action, or enjoy drinks and snacks in one of our upper lounges.